A post at the Twitter blog has just just revealed a surprising fact – there are still many Twitter users who access their account on their mobile phones using Twitter’s mobile site. So, to make their experiences more pleasant Twitter has just revamped its mobile browser-optimized site. It was really surprising that there are still many Twitter users who access their account through the old mobile site despite the fact that there are several third party Twitter apps available. Whether you are using an iPhone, Android phone, Nokia S60 and Palm Web OS phones, you will surely find one or two Twitter apps that you can download for free or for a minimal fee. Anyway, the new Twitter mobile browser-optimized can be found by pointing your phone’s browser to http://mobile.twitter.com. And one thing I can say about this new site is that it’s an all new look – almost similar to how Twitter apps look and feel like. Feature-wise the new mobile site offers just about the basic stuff that you can do on Twitter – post tweets, view DMs, Retweet tweets and more. What it won’t allow you to do is to access multiple Twitter accounts at the same time. But if you’re just using one Twitter account, the new mobile site has enough features to please you. This made wonder whether Twitter is hitting on the third-party apps that have kept the interest of mobile users into using Twitter on their mobile phones? Like I said, the new Twitter mobile site is as good as what you can get from those third-party apps. 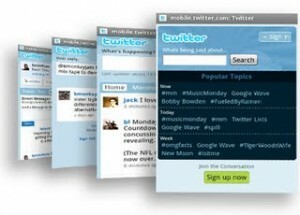 So, if you haven’t downloaded any third-party Twitter app, would you be using this new mobile site instead?